A website has been set up to get community input on a pipeline project that will carry crude oil from Crane to Houston. But you need to act fast because comments will only be accepted for a couple of weeks. From now until September 14, Magellan Midstream Partners will let you put your input in on the Longhorn Pipeline Reversal Project. 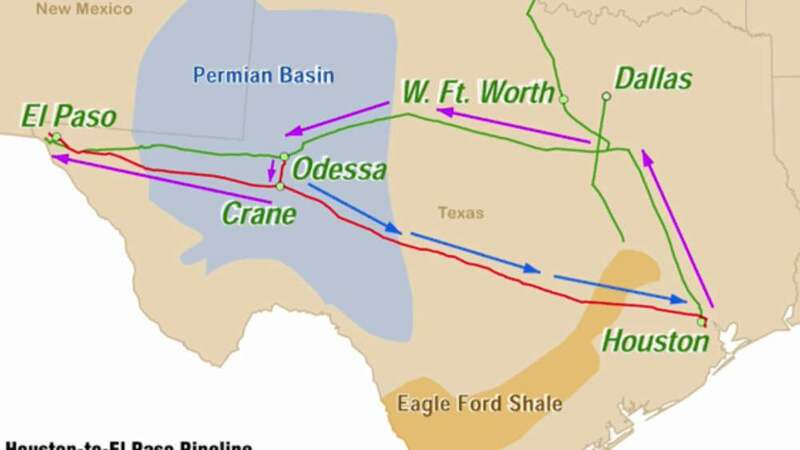 The pipeline would flow from the basin into Houston with two oil pumping sites in Crane and Midland. The $375 million project will transport thousands of barrels to Houston each day and should be in full swing by January. Click on the link to make your voice heard! Let them know you if you agree with the seizing of private property using eminent domain (thank you Texas) to build this. Berry Petroleum has invaded Gardendale disrupting lives, endangering families, and taking away futures. One simple gesture that Berry could extend to Gardendale would be these sound walls to minimize the intrusion when drilling next to homes. 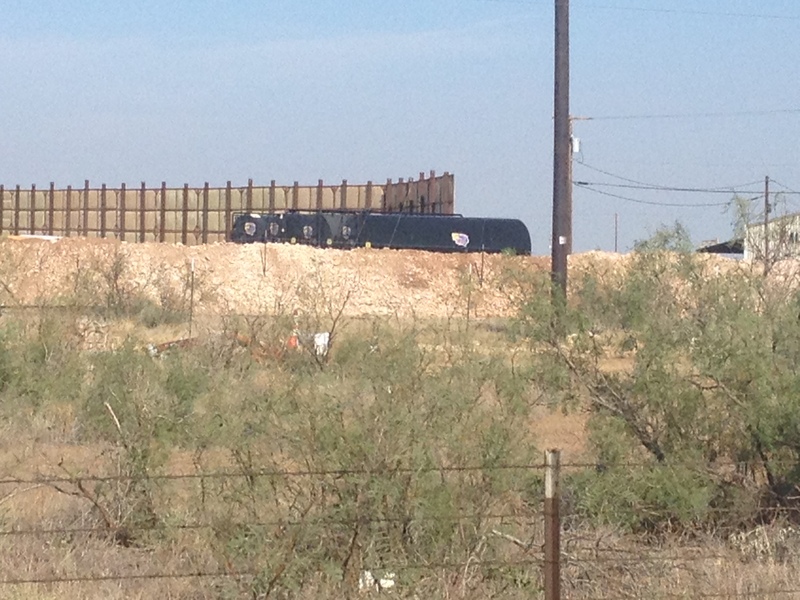 This sound wall is on the corner of State Hwy 1788 and 191 next to Calvary Church. As egregious as this drill site is, at least this company is making an attempt to limit their impact. 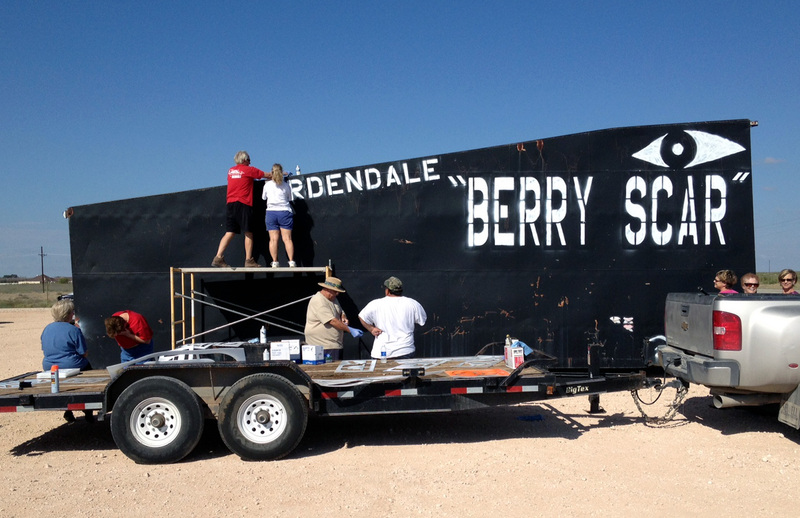 Berry for all their PR efforts through the KGB of Texas could simply “do” something good for Gardendale instead of continuing to shell out empty promises. Pipeline leak on Fasken Oil land inside Gardendale, TX. 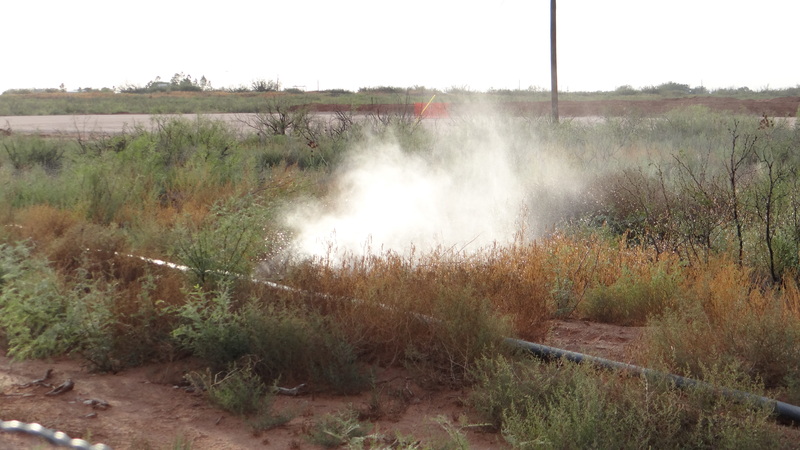 GARDAP member snapped this picture wondering what this liquid is: fresh water or produced, toxic, salt water. GARDAP will update as information comes. 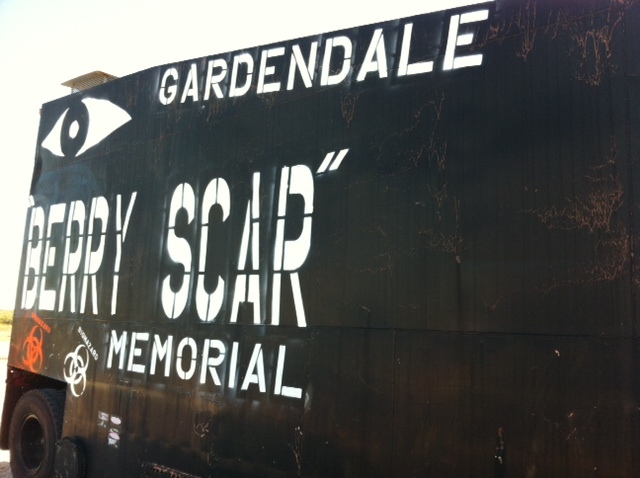 Construction of Berry Scar begins in Gardendale. See it on Hwy 158. Today, an historical marker was erected in Gardendale to commemorate a community that once was. Until two years ago, Gardendale, TX home to 2,200 plus people was a haven of quiet, country living at its finest. Horses, dogs, and families enjoyed the peacefulness of their small slice of heaven. However, Keystone Petroleum, and now, Berry Petroleum have changed all that. Berry Petroleum has forever defaced the land we live on. Instead of riding trails, we have pipelines. Instead of hay fields, we have caliche pads. Instead of clean country air, we have noxious, poisonous gas. Berry Petroleum has stolen our future, Berry Petroleum has stolen our quality of life. This memorial will stand as a testimony of that theft. 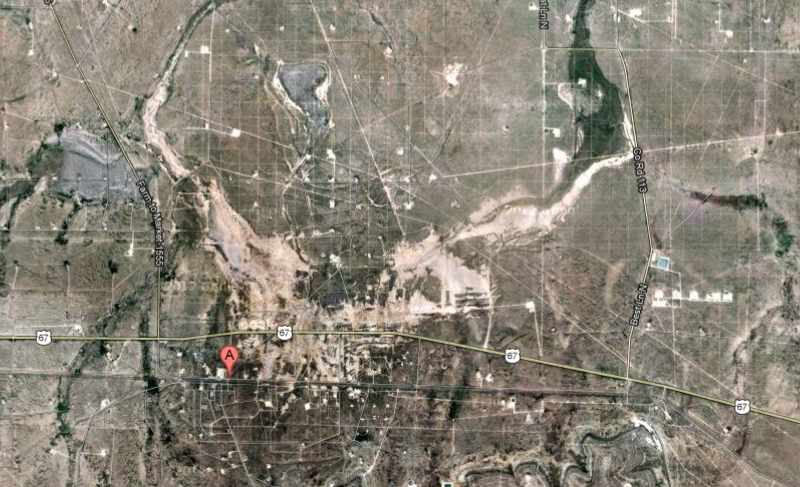 The name “Berry Scar” was chosen from a predecessor of even greater destruction, the “Texon Scar” near Big Lake, TX. The “Texon Scar” is an area of almost 12 square miles (approximately the size of Gardendale) that is essentially a dead zone. Over 2 billion barrels of produced water containing high levels of salts, were dumped on the ground killing every living plant. After almost 90 years, still nothing will grow there; it is a wasteland. Drive down Hwy 158 in Gardendale, and pay homage to the community that once was. Texon Scar near Big Lake, TX. This is what 8 billion gallons of produced water do the the land. Tests have shown levels of salt as high as 55,000 parts per million (ppm)*. 89 years later, nothing will grow here and some areas have lost several feet of top soil. In Texas alone, upwards of 9,000 wells per year are drilled using approximately 52 billion gallons of fresh water (if any oil company is really recycling produced, toxic water, they should shout it from the roof tops, but so far, silence)**. If 1/2 that water is flowback (produced) water containing salt, benzene, diesel, gasoline, etc, that’s 26 billion gallons of salt on the lands of Texas . When industry says it’s “no problem,” consider this: pits left behind in Gardendale tested positive for salt at levels above 89,000 ppm!